Sprinkle Cookies – this easy sugar cookie recipe is full of sprinkles, and there’s a dairy-free recipe option! Make them colorful for Valentine’s Day or any day! I am OBSESSED with sprinkles. I love every single color. I have a full drawer stuffed with them. I buy the rainbow ones in bulk and am always buying holiday jimmies, even when I don’t need them. because I never want to run out. I have makeup kits that are sprinkled and the wallpaper on my phone is a pic I snapped 5 years ago of the inside of a sprinkles jar. My 40th birthday party later this year? Rainbow Sprinkle themed. My obsession with sprinkles is probably why I make lots of funfetti desserts, and why I’m always making pudding cookies with sprinkles (like, for the 4th of July or Santa or Cupid or a random party). I even made cookies with sprinkles for my favorite football team to win the Super Bowl…although since Mel and I like different teams this year, I’m not going to spill who I’m rooting for (*cough* go black and red *cough*). ANYWAY, my point is, I LOVE SPRINKLES. So it’s not surprising that I added them to my favorite sugar cookie recipe. By adding lots of crunchy sprinkles to the batter, they don’t need frosting, which makes them healthier. DUH. And, it also makes them easier to make for kids with allergies. I made these dairy-free with one little substitution: butter-flavored shortening sticks. One of my daughter’s friends has to avoid dairy products, so I’m always using those Crisco sticks to make her cookies and cakes. Sprinkle Cookies = no frosting = no dairy to avoid. Dairy-free frosting is hard to make taste good. Besides, I love sprinkles more than I love frosting. 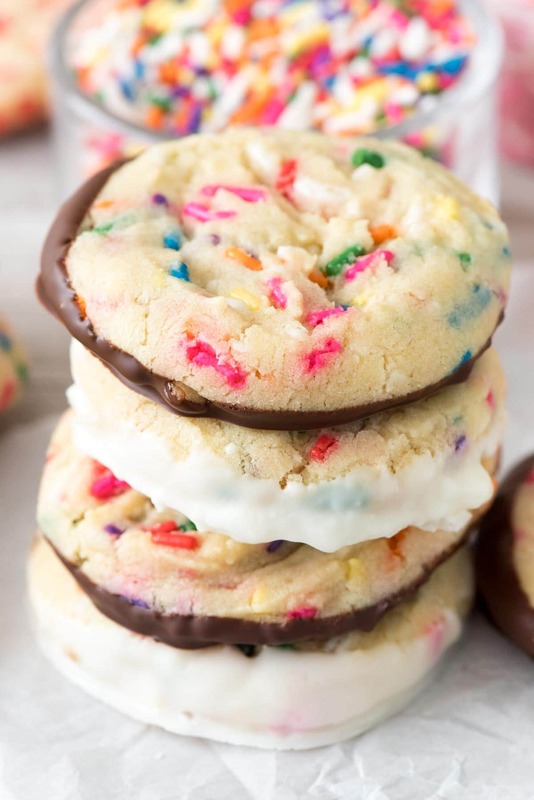 This sprinkle cookies recipe is so versatile. You can add rainbow sprinkles, which I like best. Leave them plain, or you can even dip them in melted chocolate. I did that with some of these, just because they’re so pretty (and extra yummy) dipped in dark and white chocolate. 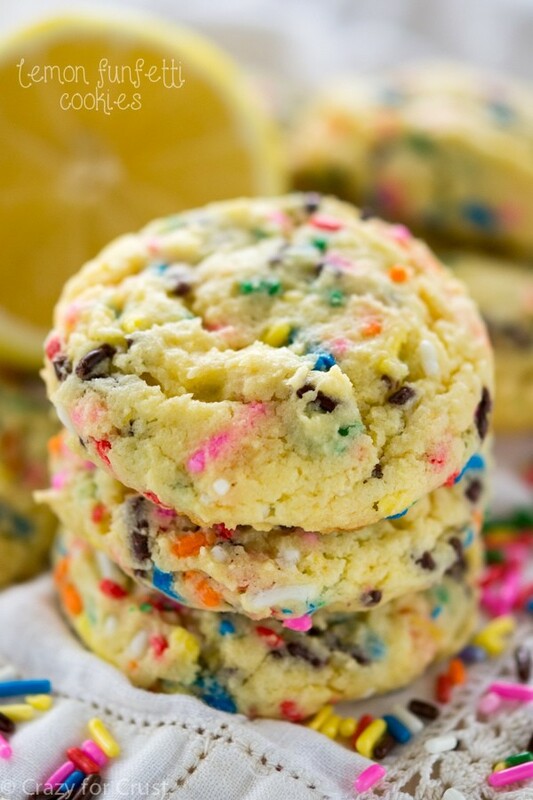 You can also make sprinkle cookies with ANY color sprinkles you like. Is it close to Valentine’s Day, by chance? Use red and pink. Christmas? Red and green. 4th of July, Halloween, Easter…there is ALWAYS a way to decorate these cookies for your favorite holiday. I’m such a sucker for pink and red sprinkles. Favorite color combo besides rainbow, hands down. 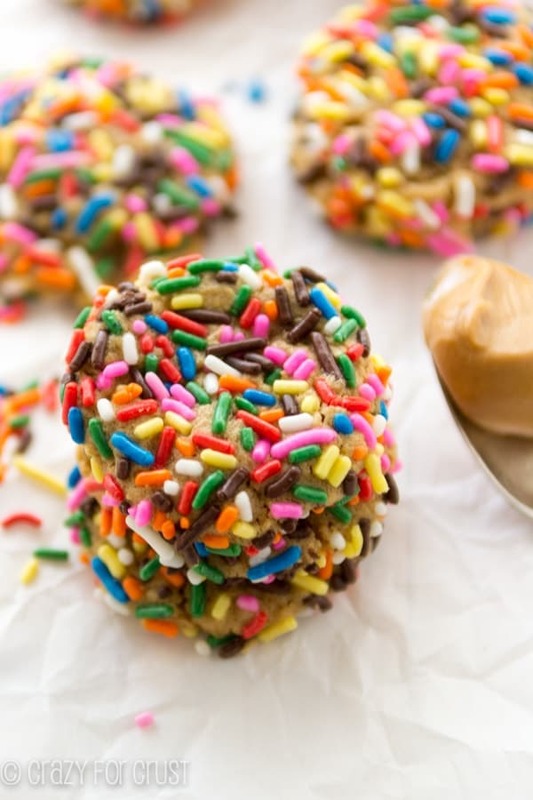 Not only are these easy to make with simple ingredients, but the kids LOVE sprinkle cookies. I think kids are suckers for sprinkles, just like I am. I mean, how can you not smile when you look at photos of sprinkle cookies?? If you can still be grumpy after looking at rainbows…well, then…I’m not sure how to help you. LOL! Want to see how easy sprinkle cookies are to make? Check out this video! 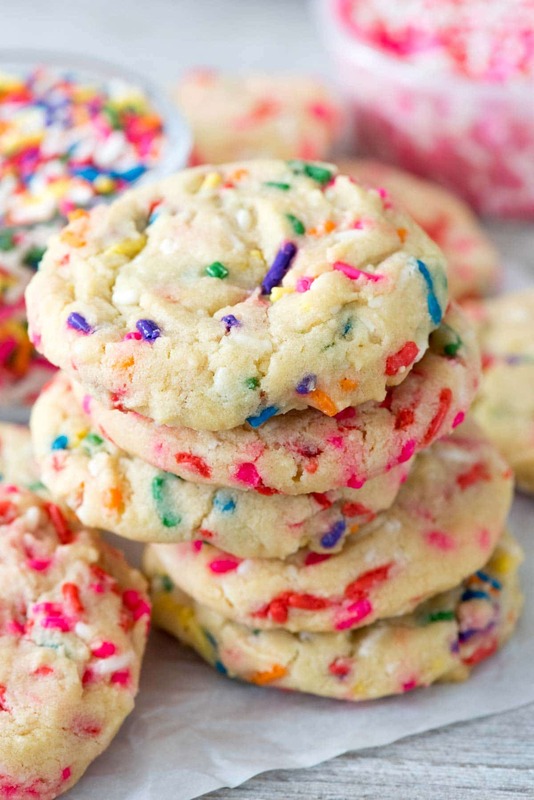 Sprinkle Cookies - this easy sugar cookie recipe is full of sprinkles with a dairy-free option! Make them colorful for Valentine's Day or any day! Cream shortening or butter and sugar with a stand mixer fitted with the paddle attachment (or you may use a hand mixer). Once the mixture is creamed and fluffy, mix in the egg and vanilla and almond extracts until smooth, then mix in the baking soda, cream of tartar, and salt. Slowly mix in flour until the mixture is just combined, then stir in the sprinkles. If you are using shortening: add 1 1/2 tablespoons of water with the flour. Scoop balls of cookie dough 2 Tablespoons each, and place them 2” apart on the prepared cookie sheets. Bake for 9-11 minutes, or until the bottoms just start to turn golden brown. (These taste better if you err on the side of under rather than over done). Cool at least 5 minutes on cookie sheet before removing. If desired: melt chocolate in a microwave safe bowl on 50% power in 30 second increments until melted and smooth. Dip the bottoms of the cookies into the chocolate and place on a wax paper lined cookie sheet. Chill to set. Funfetti Pudding Pops, from Rachel Cooks. Circus Animal Cookies and Sprinkles Ice Cream, from Your Homebased Mom. 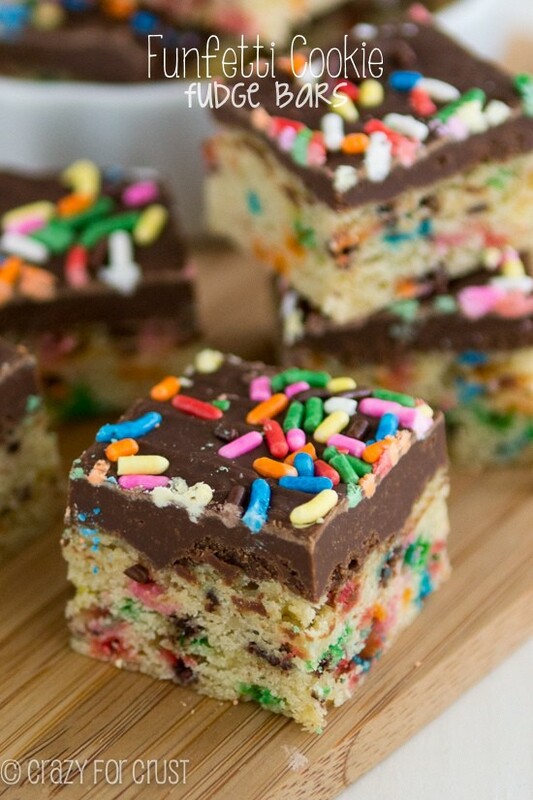 White Cake and Sprinkles Muddy Buddies, from A Dash of Sanity. The Facebook video that goes with this post was sponsored by Crisco but all opinions are my own. This post was not sponsored. So colourful and simple. 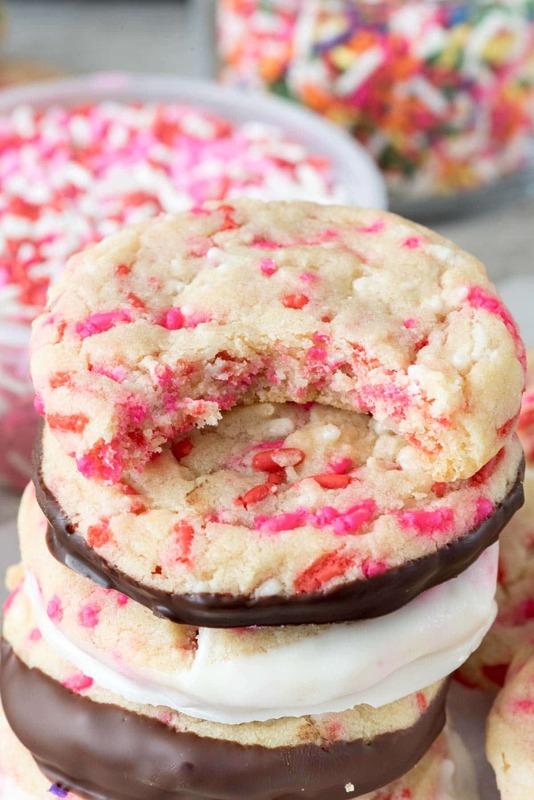 Using just pink and red sprinkles is such a clever way to make the cookies cater to Valentine’s Day! Beautiful cookies! There is just something special about sprinkles that always makes me smile. I agree that the classic rainbow ones are best! I love that your 40th was Rainbow Sprinkle themed 🙂 I love sprinkles too. I just spent over a $100 buck on fancy sprinkles I had ordered but so worth it! These cookies make me happy just looking at them….want! So much yes! I love sprinkles in any shape or form. Hey girl-these look so yummy! By the way… I turn 40 this year to, on June 8! And my sister’s husband’s name is Mel! SO cool! What is the texture and taste difference using shortening vs butter? Going to bake these for my granddaughters birthday! Made your Celebration Cookies and your red velvet cookie cake for the Super Bowl, using black red and white M&Ms and sprinkles. Big hit!!! Wish I could say the same for the game!? I live in Atlanta and we are all sad today! Now I want to try some more pudding cookies! Thank you for the great recipes!! Baked a triple batch for my granddaughters birthday at school. Used the butter crisco & only vanilla (nut allergies). They are wonderful sugar cookies! Put 2 each in 36 monster face cookie bags. They look absolutely adorable! Thank you so much for this wonderful recipe just in time for her birthday!!! Cream of tarter contains milk so be careful when making these, I don’t know if there is a substitute for it. Love the recipe, will try it, but I am sure there is a typo on the sodium content per cookie!!! 856mg per cookie is incredibly high, and the ingredient list doesn’t support that. This colorful cake is great, kids will love this cake.